This resource comes via Larry Ferlazzo (I get a lot of ideas from Larry and you should, too): this site will convert an uploaded file into a static webpage and then host it. I like the concept because I sometimes struggle with how to get my students’ work online when they don’t have email (we don’t provide email for them in our school). I have used Google Docs and also Weebly, but it always such an administrative headache for me. This site — called File2.ws (catchy, eh?) — allows you to upload without any registration, and then it converts your material into a static page and gives you the web address. I experimented this morning with one of the poems I am doing with Bud the Teacher this month and it worked pretty easily. 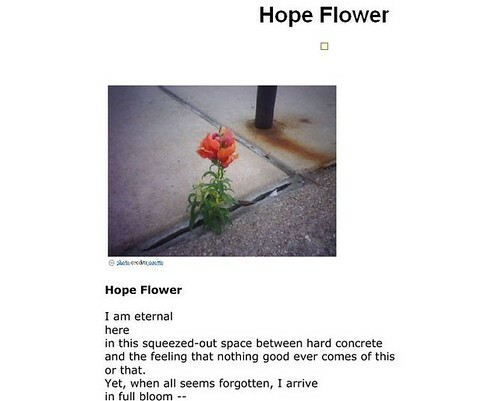 I created a Word file, added my poem and the picture from Bud’s site, and uploaded and within 20 seconds, I had a webpage created with my poem. When we get to poetry, I can see this as an easy tool for my students to use to publish their own work. That said, I read through the FAQ of the site and note that there does not seem to be advertising (but that may change, so that is something we should keep an eye on) and that if a site does not get enough hits (not sure what the sweet number is), the page can be automatically taken down to make room for other pages on the site. So, this may be just a temporary home for writing, which is fine if you view it that way, right? You may like to know that your poem page had an advert right there at the top. Thanks for the tip though. The idea is good. I did not notice it because I have adblocker on my firefox and it removes almost all ads from view. Knowing that, I would not likely use this site with my students. We used to (and still do) have add blockers on our servers at work. I have been campaigning against those for years now for the same reason as has been illustrated (excuse the pun) here. What we can’t see as teachers we can’t trust to students. That just happens to include everything we find on the net at work sigh!